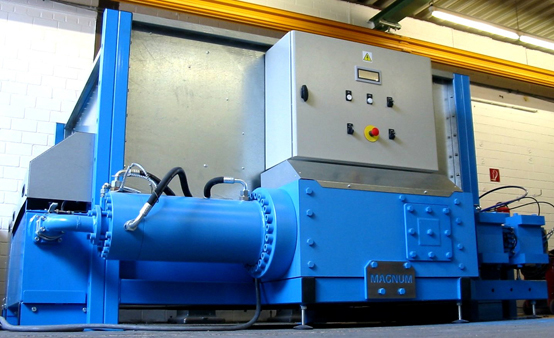 The BrikStar Magnum C22-16 comes as standard with a reservoir with integrated feed mechanism, while the BrikStar Magnum V22 has been designed to be connected to an existing, or to the operator`s own, reservoir or to be fed directly by pneumatic means. Hence the high throughput of up to 500 kg/h can be assured. The hydraulic power unit has an oil cooler and the hydraulic fluid is permanently monitored. An integrated water cooling of the hydraulic clamp makes the machine suitable for forming briquettes from even "difficult" materials with low residual moisture and constant briquette quality. Due to the construction of the press the briquettes have a rectangular shape with a density of approx. 1kg/dm³. They measure 135 x 65 x 80 up to 80 mm and have a calorific value of between 15 und 18 MJ/kg.